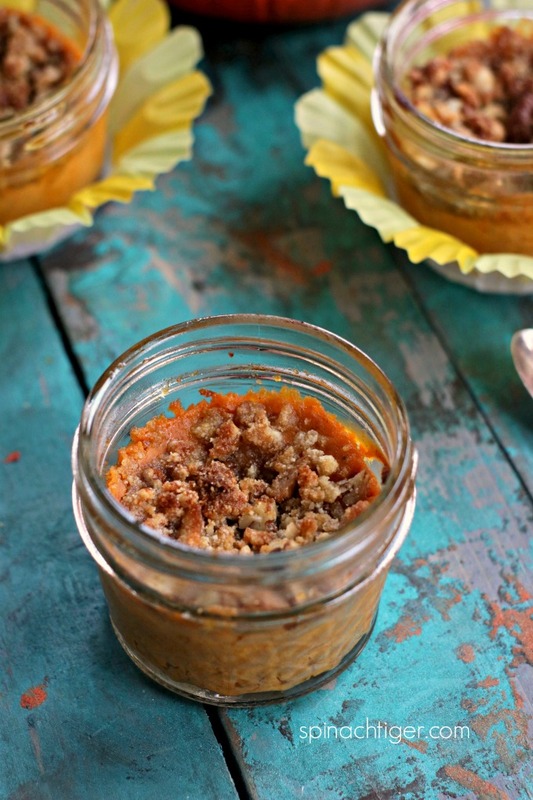 If you’re looking for a twist on a classic and you’re eating a keto friendly diet, you’re going to love these crustless pumpkin pie cups with pecan streusel topping. You get the best of everything and it’s all in individual servings. 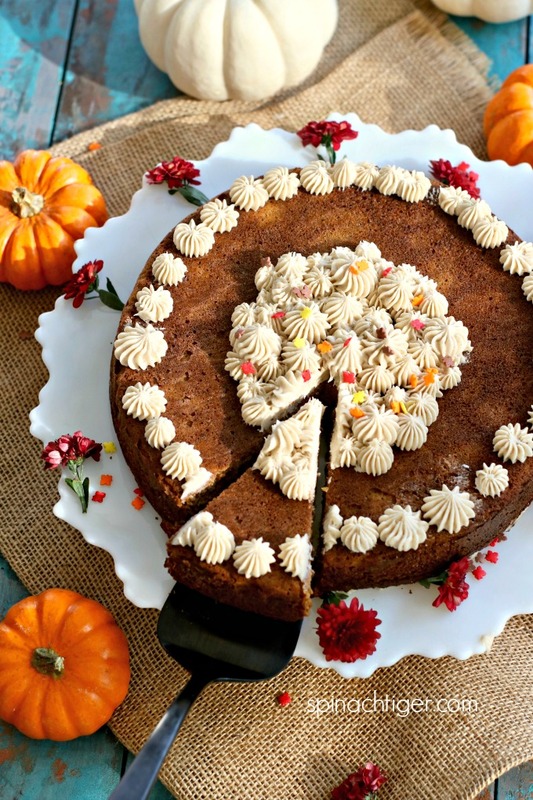 Every year I do my best to come with new pumpkin desserts and recently put them all in one place here. You’ll find a mix of sweets, including some gluten free and low-carb options. I’ve used Swerve granulated powdered erythritol in this recipe, but you could use sugar. I’m doing my best to create low-carb recipes and you all seem to love them so much. If you’re new here you’ll find plenty of regular desserts and those with alternative flours and sweeteners. My low-carb recipes are excellent, usually paleo and keto friendly. Before I started baking low-carb and grain-free, I was quite good at desserts in general. I know what to look for and how things should taste. 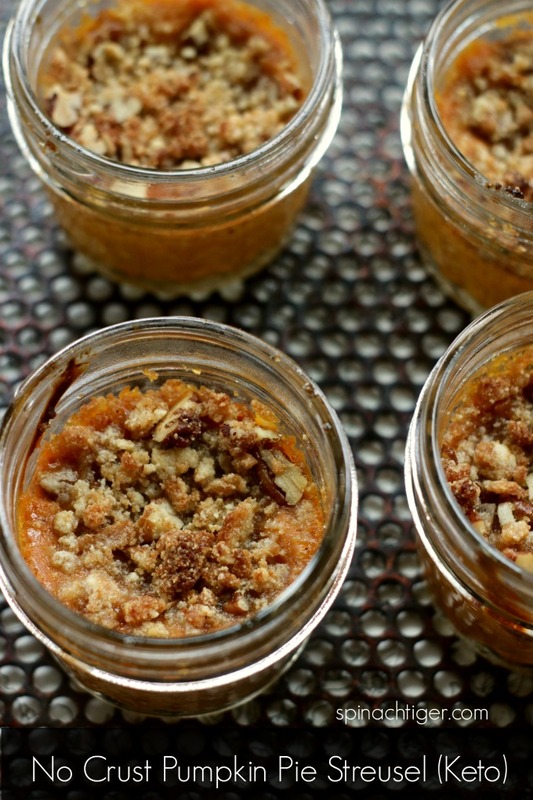 Crustless Pumpkin Pie Cups were kitchen tested three times. Every dessert gets kitchen tested until I feel it’s right. You can see that process on stories at Instagram. I do hope you join me to there, so you can be the first to see what’s coming. This recipe was tested three times. The second version was worse than the first version, but the third version (the one I’m sharing today) is excellent. In the first two versions I only added pecans, but it just wasn’t the right mouthful. I made a streusel with almond flour, Swerve’s brown sugar and chopped pecans and it gave me more of that special pumpkin pie with a twist taste and texture I was looking for. I made two versions one with more pecans, which might be more to your liking. You can decide this by adding more pecans to the top. 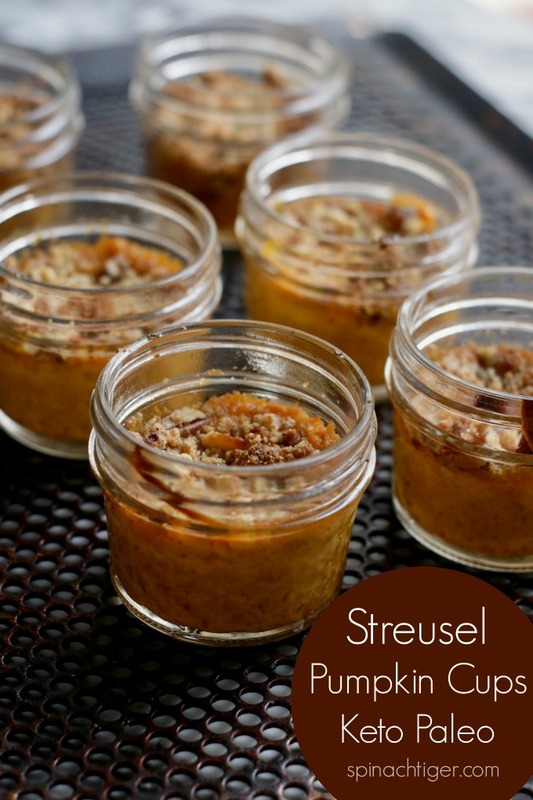 If you take anything away from this post, make this streusel. It’s so easy and you can top a lot of different desserts with it. I have a fruit crumble coming that was a huge hit with recent guests. Almond flour, cinnamon, butter, Swerve and chopped pecans are heated in a pan while stirring. Top desserts and bake until golden. So simple and it has my mind spinning for all the possibilities. When I develop a recipe, it usually begins with the season I’m in and from there I begin to address my own personal cravings. The funny thing about my recipe developing is I often conjure them up in my head while I’m at the gym. I envision taste, texture and then try to imagine how to get there in a big fat healthy way. I wanted this to taste just like the best pumpkin pie, but I didn’t want that eggy custard mouth feel. Skipping eggs and replacing with cream cheese worked well. Instead of the usual evaporated milk which is heavy on carbs, I replaced with one cup of Fair Life high protein, low-carb whole milk. You can use almond milk or coconut milk also. You may be wondering if pumpkin is okay on a low-carb diet. 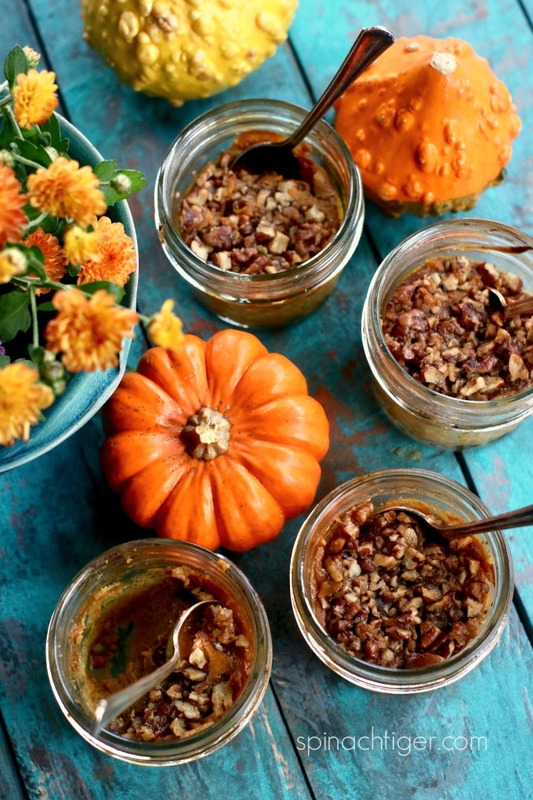 This article discusses that and all the benefits of pumpkin, so eat up. 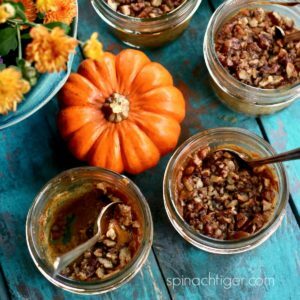 Each serving has 1/4 cup pumpkin puree, which is 3.5 net carbs. Each serving of this dessert is 5 net carbs and 103 calories. One slice of regular pumpkin pie is 46 carbs. 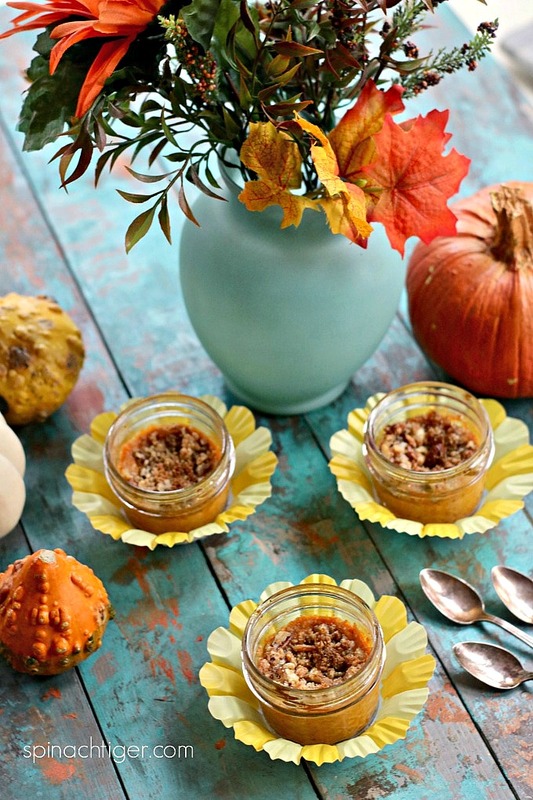 Pumpkin pie cups with pecan streusel topping, perfect for individual servings and can be frozen. This recipe contain Amazon Affiliate links which earn a small commission. Preheat oven to 350 degrees F. 180 C.
Whip cream cheese to make sure it's very softened. Add in pumpkin, pumpkin pie spice, milk, salt. Mix well. I like to use a blender. Heat small frying pan. Melt butter. Mix together, allowing some of the almond flour to clump to make a little to make streusel. You can do this two ways. You can put the streusel on the bottom or put the streusel on top. When you put it on bottom, it's more like a pumpkin pie. 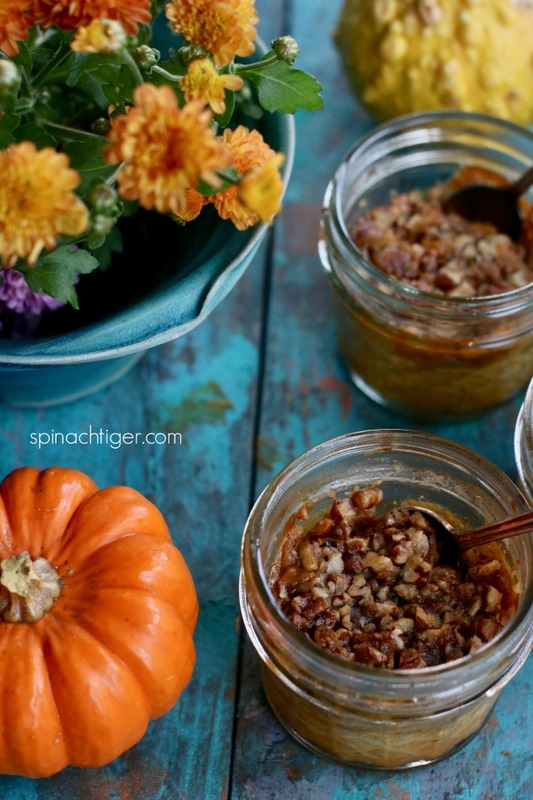 On top, it's more like a pumpkin streusel. Bake at 350 Degrees f. (180 C.) for 20 to 25 minutes. Check at 15 minutes. Cover with foil if already golden. sorry Patricia. I just fixed that 20-25 minutes. Instructions…………how long do you bake them?